"Get ready to live the life of your dreams! Beautiful acreage, located within 10 minutes of Olds, all on pavement. 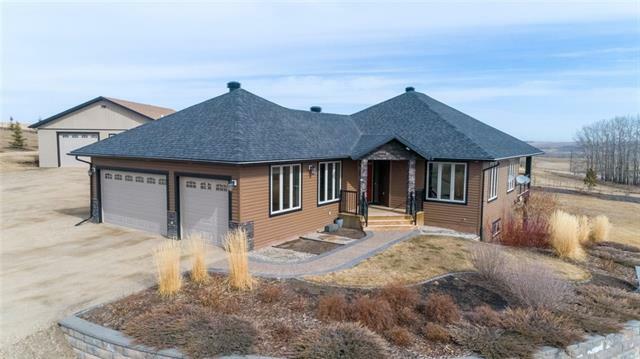 The almost new walk-out bungalow is high end and features Cambria Quartz in kitchen, with custom built cabinets, set into a large open concept living/dining/kitchen, with access to the upper deck, providing a great home for family and friends. Main floor also is home to a huge master bedroom with custom closet system, ensuite with a sit-in shower, and jetted tub, 2nd bdrm currently has built-in custom desk (could be removed) & 4pc bath. Downstairs you will love the cozy, in-flr heated 2 large bdrms, oversized media room w/access to lower deck. (projector/TV screen are incl) beautiful laundry room with tons of custom cabinetry. Heated attach garage is 30x30, and once again has lots of built-in cabinetry. Detach 24x24 garage is perfect for the muscle car, bikes or toys. In addition there is a 40x50 shop with 12' walls + 10' door which is wired for 110/220. All located on a quiet close. Must See!"